This statement bothers me for several reasons. First, it presumes that someone (other than people like us) care what we “say” about anything. Third, the statement: “The church has to say something about this” presumes that we are the church. Are we really the church, even though it is nearly impossible for most of our churches to actually give something away without trying to get a “suggested donation” or hear a religious pitch in return? Are we really the church, even though we spend the vast majority of our money on professional clergy, building maintenance, and programs to benefit our members, so much so that a community that donates a mere ten percent of their income to the poor and needy is considered generous? Are we really the church, even though our most pressing statistical priorities involve butts in seats and dollars in a budget, priorities that any halfway-honest reading of scripture indicates that Jesus didn’t share? Are we really the church, even though many of our most committed members consider the whole of their Christianity to be attending church, giving money, sitting on a committee, and going to a Bible Study? Are we really the church, even though the collective life of our denomination looks almost nothing like the Jesus we claim to follow? In our denominational ecclesiology, a group of people can get together, have a worship service in a building and otherwise live completely un-Christian lives and we have to call that “church”. If being church is a 24/7 lifestyle in community, being the body of Christ to the world (a rather uncreative statement most would agree is a solid theology), then, how is a group of people who say that they are following Jesus but whose collective lives look nothing like Jesus, really “the church”? And in the rest of the picture? 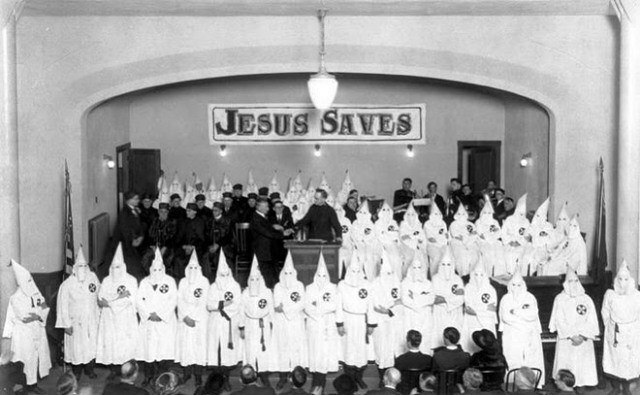 A group of white, hooded Klu-Klux Klansmen. If you read the liturgy of the Klan, (or, indeed of many groups of their ilk), it’s hard to doubt that they sincerely believe they are church, and yet, I can’t imagine Jesus doing anything but getting crucified by them. You want to tell me that’s a church? John Alexander, in his book, Being the Church, explains it this way. Fans of the Chicago Cubs don’t seem to mind too much that their team plays badly and drops the ball from time to time. But what if in the middle of a close game, the Cubs sat down in the infield and started playing tiddlywinks? Or eating lunch? No doubt, the illustration will prompt all kinds of supposedly entertaining remarks about the Cubs, but when the people of God forget what they’re about, it’s not entertaining. Dropping the ball is one thing. We all do that. I certainly do. And the most casual reading of 1 Corinthians or of Revelation 2-3 prepares us for church that drop the ball. Often and badly, even. But I’m not sure it prepares us for churches playing the wrong game…. What’s troubling isn’t that churches fail…The New Testament gives us little reason to expect heroics of ourselves or of others with regularity. When our so-called churches don’t really look like Jesus, even when they have some positive benefit for those who participate in them, that’s the Rotary Club, not the church. Maybe it’s time for us to stop discussing whether we’re doing church well and discuss whether we’re doing church at all. I think this is true Bill – and there are several metaphors like this idea of church as mother that can help us check whether we’re being church or not. For me, the most helpful metaphor has been the image of being poured out, as it’s talked about in Philippians 2. Pope Francis has a lot of wisdom to teach the church about being church, I think.